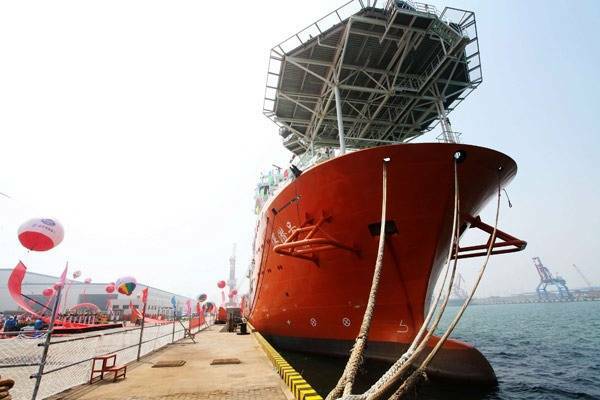 China’s largest submersible-support vessel delivered to Shanghai Salvage by Wuchang Shipbuilding Industry shipyard. China’s largest submersible-support vessel has been delivered and put into service in Qingdao, Shandong province, marking a breakthrough in the development of the country’s deep-water salvage force. Shenqianhao, China's first ship that carries a saturation diving system allowing divers to work at depths of up to 300 meters, is the nation’s most advanced submersible-support vessel, capable of completing submarine rescue and lifting missions as well as other underwater projects, according to a statement from the rescue and salvage bureau under the Ministry of Transport. The vessel is equipped with a deep-water saturation diving system, which allows 12 divers to work in turns at a depth of 300 meters — 100 meters deeper than in the past, said Shen Hao, director of Shanghai Salvage Co. The system allows divers to live in an enclosed pressurized environment before they enter the water. A diving bell then takes three divers at a time into deep waters to carry out underwater operations, and returns them to the living capsule to change shifts. The divers can be decompressed to surface pressure only once — at the end of their tour of duty. The process, known as saturation diving, enables divers to work uninterrupted in deep waters for long periods without the risk of decompression sickness. The 13,000-ton ship is 125 meters in length, and is equipped with a helicopter landing platform and a crane with a lifting capacity of 140 tons, capable of pulling sunken ships and cargo from the sea.